We welcome 8th Grade students (and parents) to begin a further exploration of MMA through our Admissions process. This is an exciting time in your life, as you look forward to beginning the next chapter of your own unique and impressive story! We want this process to go smoothly, so if you have any questions regarding applying to MMA, feel free to contact the Admissions Office at 610-664-6655 ext.166. As an applicant, we encourage you to visit us at Open House (October 7), "shadow" a freshman student with a Fall Visit Day, and we require that you take the Scholarship and Entrance Exam (applicants who submit the online application will be registered for the Scholarship and Entrance Exam). Formal acceptance notices will be sent out in mid-December. 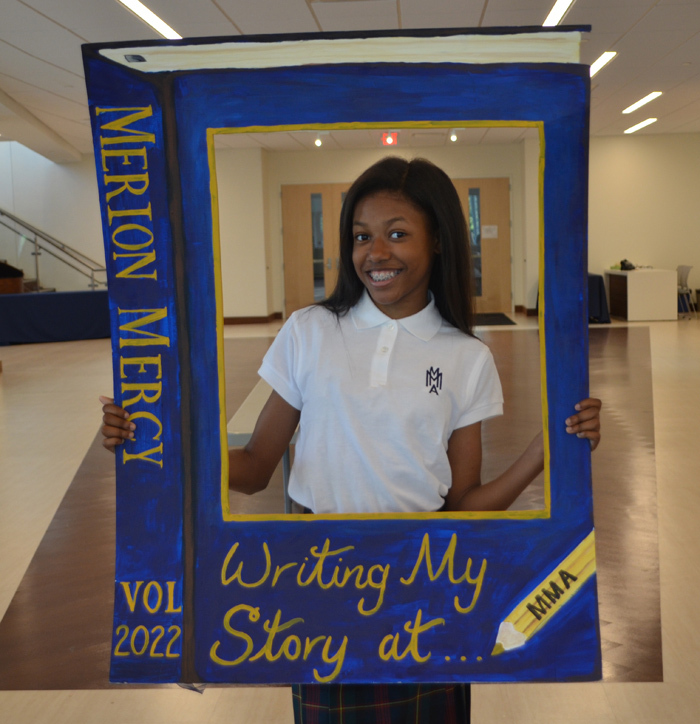 To review more information about Merion Mercy, please peruse our 2017-18 School Profile. 1. Click here for the Application/Test Registration form (one form). 2. Submit Merion Mercy's Request for Release of Records Form to your elementary school for a copy of your permanent record form and all standardized test scores. These records are due to Merion Mercy by November 9, 2018. First trimester/quarter report cards for eighth grade are due as soon as they are available. 3. Submit two teacher recommendations using the Teacher Recommendation Form. We prefer that a math and language arts teacher complete the recommendations. At least one recommendation must be completed by an eighth grade teacher. Recommendations are due November 9, 2018. 4. Applicants are encouraged to visit Merion Mercy for the day, from October 1 through mid- December, 2018. Click here to register online. 5. Take the Scholarship and Entrance Exam on Saturday, October 27, 2018 (makeup date Saturday, November 3, 2018). Please note: The Financial Aid Application is a separate form. Click here for more information. For transfer students interested in applying for the 2018-19 school year, please click here.